An illustrated book, compiled by Patricia Jorna was published in 1994 to mark the 150th anniversary of the present Parish Church of St Anne. The libraries in Beverley and South Cave have copies of this book for loan and for reference. 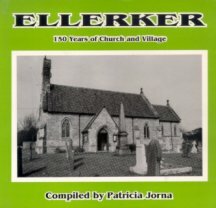 Mrs Patricia Jorna wrote a book St Anne’s of Ellerker (1999), ISBN 1 902645 0 49, also available in libraries. Copies of the 1766 Ellerker Enclosure Award and a map of the allotments are available for reference in the East Riding Archives at The Treasure House in Beverley. A transcript of the Enclosure Award is available as a PDF file… but please note that it has not been verified by comparison with the original document. A copy of the 1844 Tithe Award for Brantingham Parish (which at that time included Ellerker) is available for reference at the Borthwick Institute for Archives which is situated on the York University campus.